Point Pleasant defenders Nick Leport (14) and Josh Wamsley (2) bring down a Mingo Central ball carrier during a Class AA opening round playoff contest on Nov. 10 at OVB Field in Point Pleasant, W.Va.
Point Pleasant junior Brady Adkins (26) breaks away from a pair of Mingo Central defenders during a Class AA opening round playoff contest on Nov. 10 at OVB Field in Point Pleasant, W.Va.
And headed into the 2018 WVSSAC Class AA playoffs, the Polar Bears are the man. 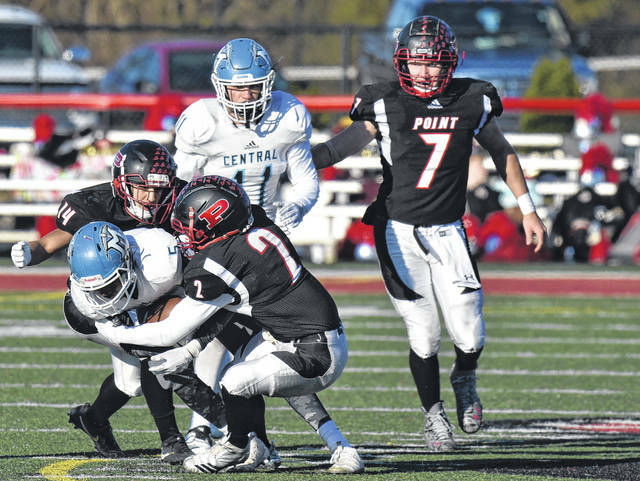 The Point Pleasant football team will try to defy the odds and bring home the program’s first-ever road win on Saturday afternoon when the eighth-seeded Big Blacks take on top-ranked Fairmont Senior in a Class AA quarterfinal playoff game at East-West Stadium in Marion County. The Big Blacks (9-1) survived a stern test in rather impressive fashion last week by outscoring Mingo Central 36-7 after halftime en route to a 65-36 victory in their opening round playoff contest. The Polar Bears, conversely, were simply dominant against Lewis County from start to finish last weekend in their 56-6 opening round triumph. Needless to say, FSHS (11-0) has been nothing short of impressive during a 2018 campaign that has produced the program’s first unbeaten regular season since 1978. The two-time reigning Class AA runner-up Polar Bears have outscored opponents by an average of 41.3 points through 11 contests, and their closest game to date was a 26-point decision at Robert C. Byrd in the season opener. The Red and Royal Blue have scored at least 43 points in all but one of their 11 victories while also holding opponents to single digits in six of those contests. Fairmont Senior has scored a season-high 64 points twice and owns one shutout over Preston (64-0) in Week 7. Fresh off of his 10th career playoff victory, PPHS football coach David Darst (10-10) acknowledges that his troops might be facing one of the best football teams he’s seen during his 12-year tenure with the program. As the venerable mentor noted, it will take Point Pleasant’s best performance to win this first-ever gridiron matchup. “They have a very good football program and we are definitely going to have to play our best football game to be able to go up there and pull off a win on the road,” Darst said. “We’re excited about playing Fairmont Senior for the first time, but we know that it’s going to be quite a test. We have to know where their playmakers are at and we have to contain that quarterback when he’s moving around. The Polar Bears lost the 2016 AA championship game to Mingo Central (29-26) and were defeated by Bluefield (32-7) in last year’s AA final, so they too know what it’s like to be eliminated by a state champion recently. Point Pleasant also lost to Bluefield (49-17) in last year’s AA playoff run. Fairmont Senior is aiming for the program’s sixth state championship, as well as the first for the program since 1946. FSHS has outscored opponents by a 558-103 overall margin in 11 games, which averages out to 50.7 points offensively and 9.4 points defensively. The Polar Bears have five running backs with over 100 rushing yards this season and have also amassed 1,763 yards on the ground, an average of 160 rushing yards per contest. Rhett Heston is the team’s leading rusher with 502 yards and six scores on 42 attempts, while Kie Cottingham is next with 352 yards and four scores on 47 carries. Gage Michael also has 266 yards and six scores on 28 totes. The Polar Bears, however, are most dangerous through the air, amassing 2,877 passing yards and 40 touchdowns while throwing only three interceptions. Southpaw quarterback Conner Neal has completed 165-of-220 passes for 2,877 yards, which includes all 40 scores and three interceptions. The Polar Bears have nine different receivers with at least five catches this fall, and seven of those wideouts also have at least one touchdown grab. Jake Pittman leads a dangerous receiving corps with 39 catches for 737 yards and 13 scores, followed by Camden Longwell with 28 grabs for 480 yards and four scores. J.D. Smith also has 24 receptions for 612 yards and nine touchdowns. Placekicker Frankie Smith is a perfect 3-of-3 on field goal attempts, with a long of 39 yards, and is also 56-of-58 on PAT kicks. Fairmont Senior has 10 different players with at least one interception this season and is also plus-12 in turnover differential. The Polar Bears are producing 421.8 yards of total offense per game while allowing only 181.9 yards defensively, including a mere 61.1 yards passing each contest. The Big Blacks enter Saturday averaging 50.5 points and 485 yards of total offense per contest, including 318.2 rushing yards each game. Point has converted two field goals and 50-of-60 extra-point kicks this fall. Senior Cason Payne has completed 115-of-171 passes for 1,533 yards, throwing 16 touchdowns and only three interceptions. Payne is also the team’s leading rusher with 1,181 yards and 22 scores on 125 attempts. Junior Brady Adkins joins Payne in the backfield with 119 carries for 1,050 yards and 15 scores. Senior Josh Wamsley leads the wideouts with 43 catches for 514 yards and eight touchdowns. The Red and Black have surrendered 21.0 points and 280.5 yards per game defensively. The Big Blacks are plus-3 in turnover differential and have held four opponents to single digits this fall, including shutouts over Warren and Man. Point Pleasant has surrendered only 20 first quarter points and has two defensive touchdowns and a pair of special teams touchdowns to its credit. Darst has mentioned previously that the eventual state champion has defeated Point Pleasant twice in the last three years, and Fairmont Senior certainly has enough talent to extend that streak another year. Darst, however, believes that his troops are more of the hunters than the hunted this weekend, allowing them to go into a hostile environment with a little less pressure to shoulder. If the Big Blacks can play up to their potential, and maybe catch a break or two along the way, Darst believes that anything is possible this time of year. After all, his squad is also one of the last eight teams playing football in Class AA. “The kids are excited about this challenge, and they know it won’t be easy, but they have been getting after it in practice this week,” Darst said. “It’s that point in time of the year where you know everyone is facing good football teams. There are only eight of us left in double-A, and we are facing the top team remaining of those eight. Kickoff at historic Fairmont East-West Stadium is slated for 1:30 p.m. Saturday. 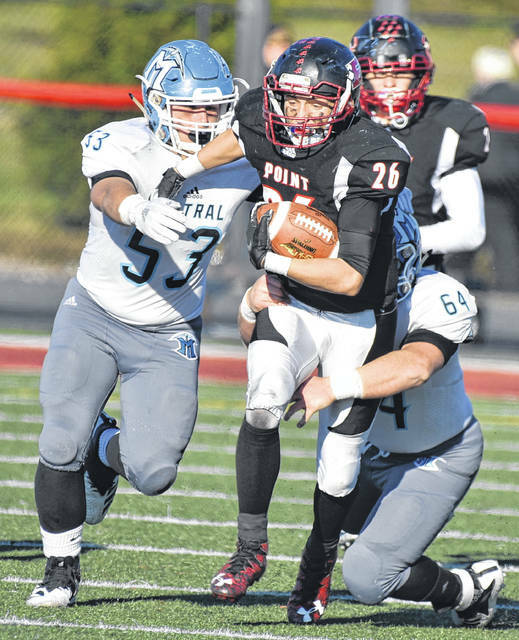 https://www.mydailytribune.com/wp-content/uploads/sites/42/2018/11/web1_11.16-PP-Defense.jpgPoint Pleasant defenders Nick Leport (14) and Josh Wamsley (2) bring down a Mingo Central ball carrier during a Class AA opening round playoff contest on Nov. 10 at OVB Field in Point Pleasant, W.Va.
https://www.mydailytribune.com/wp-content/uploads/sites/42/2018/11/web1_11.16-PP-Tall.jpgPoint Pleasant junior Brady Adkins (26) breaks away from a pair of Mingo Central defenders during a Class AA opening round playoff contest on Nov. 10 at OVB Field in Point Pleasant, W.Va.